"So how did you guys meet??" It's a popular question posed to people who are newly engaged or newly married or newly showing up at a party and not really knowing anyone and trying to make small talk. To the best of our knowledge, you ladies don't fit any of the qualifications listed above, but we're asking you that question anyway. Only it's not about you and another person... it's about you and Pride and Prejudice 1995. How did you meet our very favoritest of favorite movies? Was it through the recommendation of a friend? A desire to see the movie after reading the book? A stroll through the shelves at the library and the enticement of an eye-catching DVD case? Do tell! Simply send us an email at shelvesinthecloset95[AT]gmail[DOT]com and give us your story. It can be as brief or as long as you like, but we recommend keeping it somewhere between 200 and 1,000 words. We will post stories on the blog over the next several weeks, starting with our own to get the event kicked off. Note: We reserve the right to change very minor grammatical issues. I honestly don't remember how I got hooked on Jane Austen and P&P in particular. It probably was because of friends who read her books and were talking about them and the movie adaptions and got me interested. I am so very glad they did! 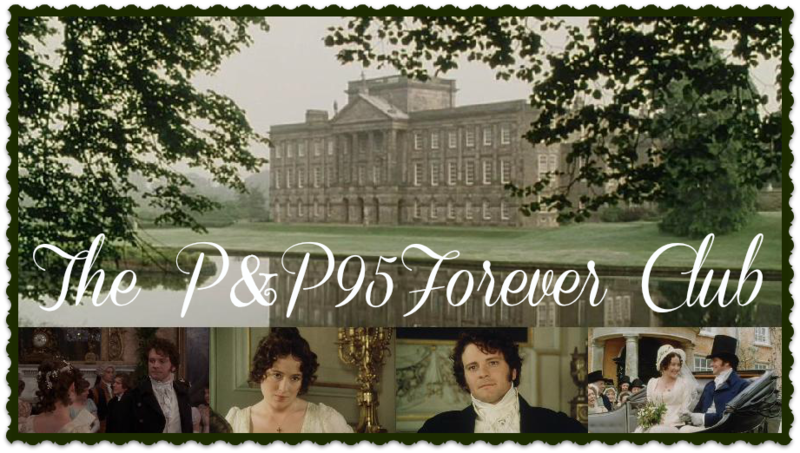 We have had Jane Austen movie nights and watched old and new versions of them, but the 1995 P&P is always our favorite of the bunch. We would just like to note that if you wish to send in a story about How You Met P&P95, we would appreciate it if you send the story to us in an email instead of leaving it in a comment. Also, since we intend to make each story a post in and of itself (as part of the series each Friday) it would be loverly if you could make your story at least 300 words. Thanks so much and don't forget to enter the giveaway! Double Challenge Caption Contest - Winner!